Now posthumously famous around the world, J.R.R. Tolkien and C.S. Lewis have had a huge impact on our modern culture. Many video games, fantasy novels, and role-playing games (including Dungeons and Dragons) have been strongly influenced by The Lord of the Rings [A]. Gary Gygax, the maker of Dungeons and Dragons, originally incorporated story elements from Lord of the Rings before changing these when the game was sold to the public [A]. 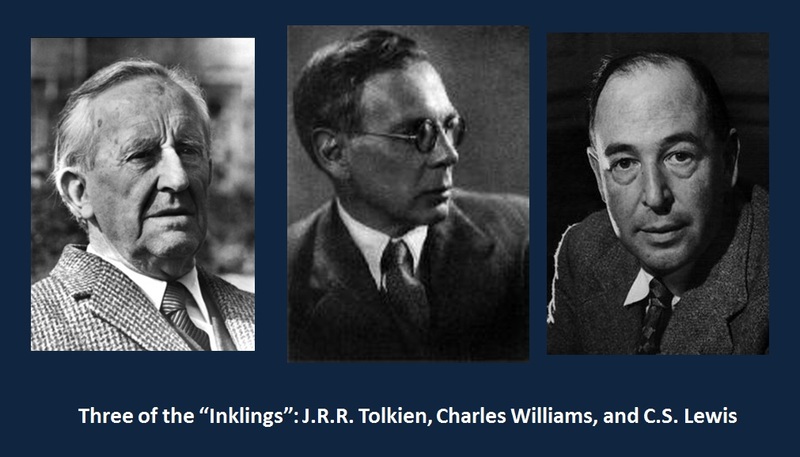 Tolkien, Lewis, and other Oxford professors and writers, together, formed a small group known as the "Inklings." They would meet together to discuss literature and read aloud their fiction manuscripts. We will now look at one "Inkling" in particular. A man you may not have heard of befriended J.R.R. Tolkien and C.S. Lewis, and played an important a role in influencing their writing. 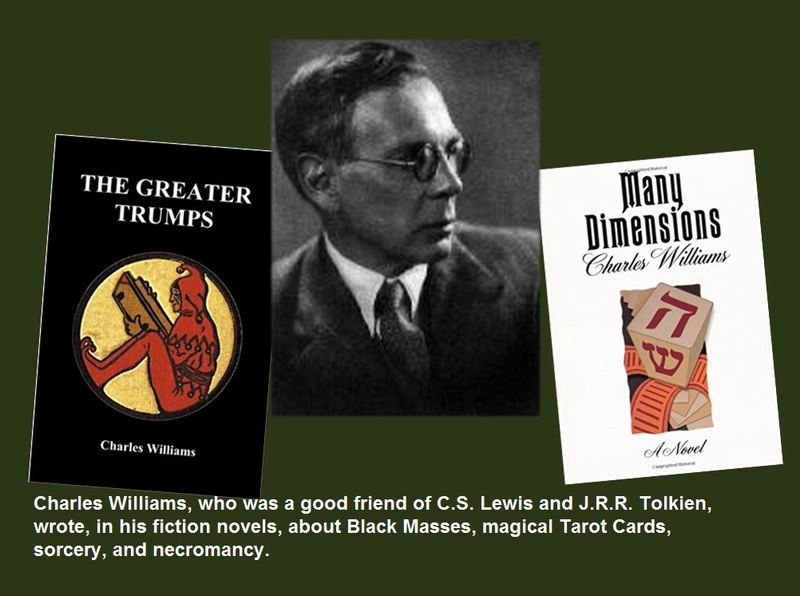 His name was Charles Williams, an esoteric author of novels, poems, and nonfiction works. What makes him an interesting character is his fascination with the occult. 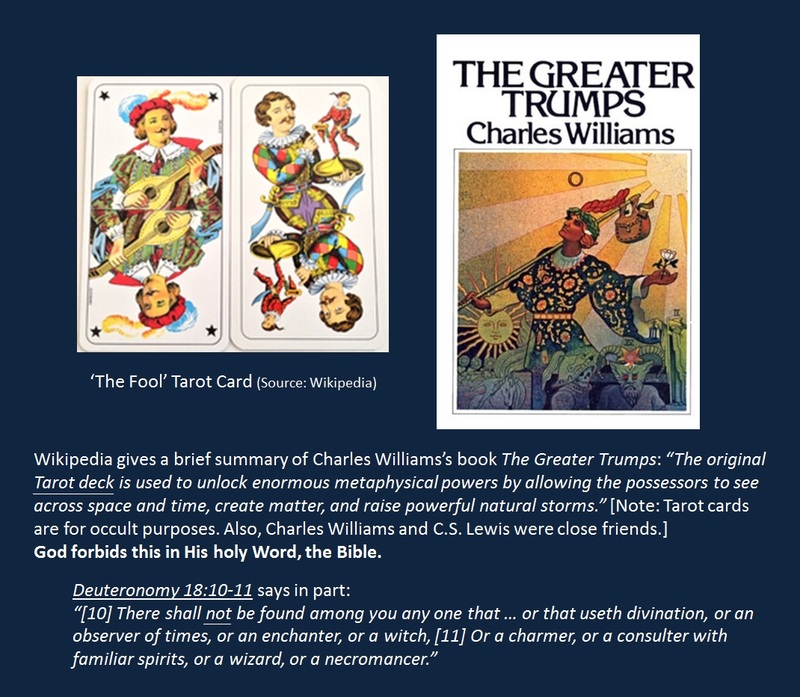 At the age of about 30, Williams joined a secret society that focused on occult rituals, ‘magick,’ and gnostic teachings. God forbids the occult and witchcraft in Deuteronomy 18 and elsewhere. 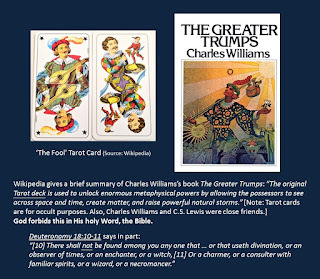 How Close Were Charles Williams, C.S. Lewis, and J.R.R. Tolkien? How close were Lewis and Tolkien to occultist Charles Williams? They were very close. They all were very fond of occult literature and concepts. C.S. 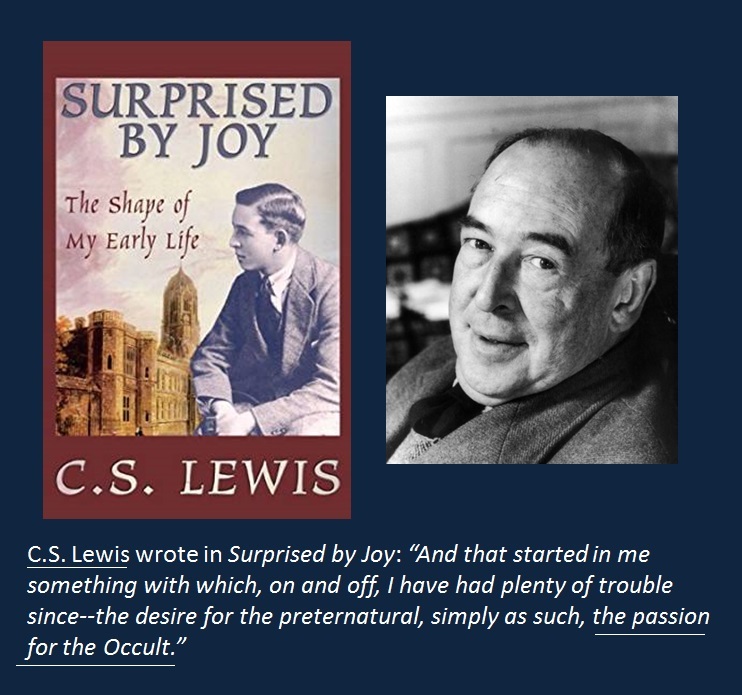 Lewis even admitted in his book Surprised by Joy that he had a craving for the occult. In this book, Lewis wrote of how, during his time in a boarding school, a teacher (Miss. C.) taught on occult subjects of “Theosophy, Rosicrucianism, Spiritualism; the whole Anglo-American Occultist tradition.” [E.]. Lewis was captivated because including the occult into “Christianity” made sense to him. C.S. Lewis admitted he loved paganism, and he even thought that Apollo, the Greek sun god, was a type of Christ. That is heresy. Jesus Christ came to the earth as a man, died (to his human body), and rose from the dead (in a resurrected body). Apollo did none of those things. 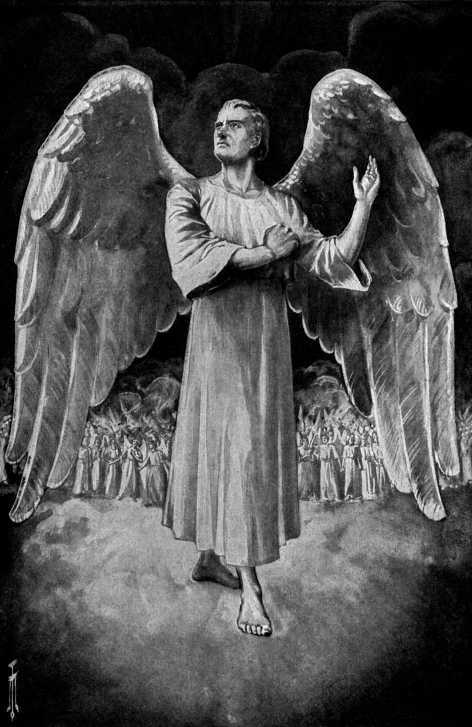 Apollo, known for light; occult ‘medicine;’ and so-called ‘prophecy,’ is another name for Lucifer, who high-level Freemasons say “bears the light”. The Bible warns us of Satan’s disguises in 2 Corinthians 11. “ Enter ye in at the strait gate: for wide is the gate, and broad is the way, that leadeth to destruction, and many there be which go in thereat: 14 because strait is the gate, and narrow is the way, which leadeth unto life, and few there be that find it. Is What True Christianity Is All About. [A.] Chan, Sue. “'Lord' Reigns In Pop Culture.” cbsnews.com. [B.] "The INKLINGS - Charles Williams." crossroad.to. [C.] “Charles Williams (British writer).” en.wikipedia.org. [D.] Jacobs, Alan. "The Narnian." books.google.com. [E.] Lewis, C.S. "Surprised by Joy." gutenberg.ca. [G.] (From: crossroad.to --) Roger Lancelyn Green, C.S. Lewis: A Biography, Revised Edition (Orlando, FL: Harcourt Inc., 1974), page 30, 274. [H.] (From: Amazing Discoveries --) Albert Pike, "Morals and Dogma of the Ancient and Accepted Scottish Rite of Freemasonry ..." (Richmond, Virginia: L.H. Jenkins, 1871, Reprinted 1944): 321.